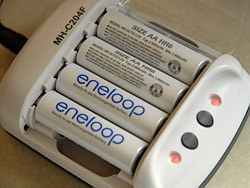 Costco recently had a set of these with 8 AA and 4 AAA batteries, plus a charger for just about $20. This is quite a deal and these batteries are great. Ah thanks for the news .... I hope it will hit the shelfs soon, cuz im frustrated with my batteries! After unsuccessfully looking around for these batteries in Switzerland and Austria, I discovered that there are a number of other companies that build similar types of batteries. They are easily recognised being labelled as 'Ready to use' or similar. The two types I have bought so far are "Varta Ready 2 use" and "Panasonic Infinium". They both claim more than 80% capacity after one year. Aw, this was a really quality post. In theory Id like to write like this too - taking time and real effort to make a good article... but what can I say... I procrastinate alot and never seem to get something done.